Plant a Row for the Hungry (PAR)is a national program that encourages gardeners to plant and donate produce to those needing food assistance in their communities. In Springfield, the University of Illinois Extension Master Gardener volunteers have led a local effort to share fresh produce. For the past 19 years, volunteers have worked with the Central Illinois Food Bank and local food pantries. One special partnership is with the Village of Chatham. About 12 years ago, the Village set aside a generous tract of land near its electrical department for Master Gardeners to use for a dedicated PAR Garden. For the past several years, Girl Scouts from Chatham Troop Number 6170 have worked with Master Gardeners to plant and harvest peppers and sweet potatoes. 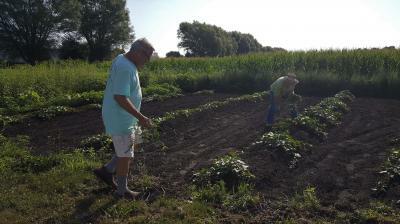 Most of the produce raised in this garden goes to the Central Illinois Food Bank for distribution. 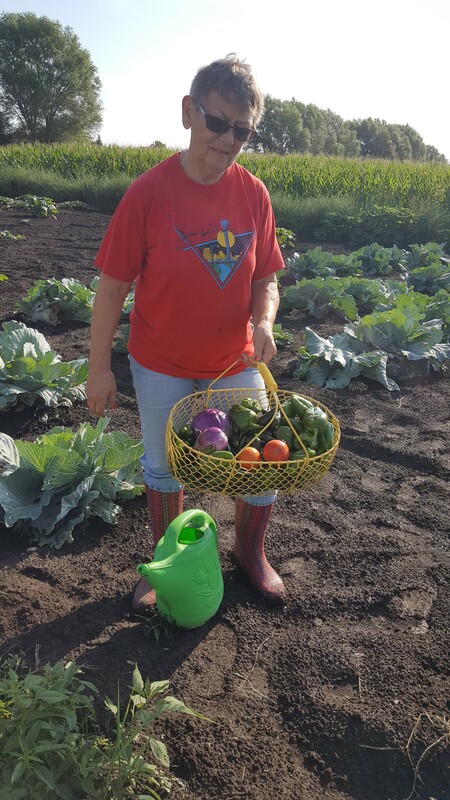 Some produce is taken directly to St. John's Breadline,or Holy Family Food Pantry.All produce is given away to area residents.Through the years, this garden has supplied tons of healthy vegetables, including more than 2,500 pounds in 2016 alone. It also won the Best Vegetable Garden Award from the Chatham Area Chamber of Commerce as part of the Greenways of Chatham Beautification Contest in 2015. In the photos, you can see Master Gardeners at work this weekin theChathamPAR Garden.Mary Ann McLean harvesteda basket of peppers, eggplant and tomatoes while Tom Hiler and Veronica Fesser weeded the sweet potatoes planted earlier in the season. Many individuals, church communities and other groups also participate in the PAR program.All vegetable gardeners are encouraged to share their produce with a local food pantry. For more information on PAR and sharing produce, call (217) 782-4617.